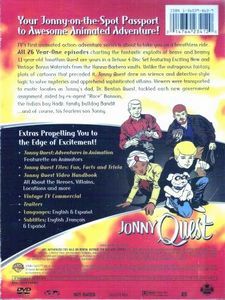 Jonny Quest is about the adventures of Jonny Quest and his father Dr. Benton Quest. Along for the adventure is the multi-faceted "Race" Bannon, the mystical Hadji, and Jonny's dog, the irrepressible Bandit. They solve mysteries and try to thwart the evil of Dr. Zin. However, when Jonny Quest ended in 1965, it was far from finished. Jonny Quest went into syndication in 1986 for a short 13 episode sting as The New Adventures of Jonny Quest (1986). The Real Adventures of Jonny Quest emerged on the Cartoon Network with 2 full seasons of new and exciting adventures in 1996. 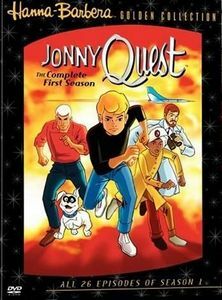 Jonny Quest had successfully run 3 series dating back to the 60's and is still well known classic today. Five ships disappear in the Sargasso Sea. Finally, there's a survivor, who describes a ""thin, red light"". The authorities bring in noted scientist Dr. Benton Quest. Together with son Jonny, bodyguard Race Bannon, and (of course) Bandit the dog, Dr. Quest investigates. Someone is conducting laser experiments from a converted galleon, and plans to shoot down the new Man In The Moon rocket! It's up to Jonny, his father, and their friends to stop this scheme. An satellite missile is sabotaged to land in the Arctic and is to be recovered by some people with a submarine. They would use the technology in the missile for their uses. When the Quest teams figures it out the only thing they can do is destroy the missile and head back home. Dr. Ahmed Kareem steals the statue of Anubis from the Temple of Anubis. He plans to implicate an outsider for the theft, and unify Arab nations against the outside world. The outsider he chooses is Benton Quest! But his plan almost succeeds: he traps Dr. Quest and Race in an old tomb with the statue. There they will be found with the statue. In the end, he discovers the horrifying truth: the Curse of Anubis - death to those who violate his temple - is all too real. Anubis sends someone to retrieve his statue and punish Dr. Kareem. Dr. Quest, Race, and Jonny are in Calcutta investigating the use of nerve gas on a number of mountain sheep herders. They are introduced to Hadji when he foils an assassination attempt on Dr. Quest. The four head off in search of the assassins and the men behind the use of nerve gas. With the help of a Indian merchant named Pasha Peddler, they discover a secret weapons factory inside a mountain. Dr. Quest, however, is captured and taken within the mountain. He is eventually rescued by Race. After they leave, Dr. Quest uses his sonic amplifier to create an avalanche which buries the assassins and destroys the weapons factory. Dr. Quest and Race Bannon investigate a strange, alien ship that crash lands near one of Dr. Quest's labs. Danger ensues when it turns out that the ""alien"" is a spy sent from one of Dr. Quest's archenemies. Engine troubles cause Race to land in the Andes mountains. Baron Frohlicke greets the Quest team at his very short landing strip. The Baron has sinister plans for Race since he is able to pilot the jet down so expertly. Dr. Quest and Race find out more about the Baron. The climax of the story is Race and the Baron have a dogfight. Who will win? Who will lose? Only Fate and a giant Condor will decide. Modern day pirates are after the treasure from a sunken Spanish galleon. When Jonny finds a doubloon near a wreck, the pirates make their move. They take the Quest team hostage and force Jonny to return for the treasure. Rescue comes from an improbable source, as Bandit dons scuba gear and alerts the local coast guard! A chase begins, ending with the pirates sunk and the treasure back in Davy Jones' locker. A tribe of hostile pygmies takes Race and Hadji prisoner. Will they be able to find a way to escape? The Quest team is looking for trinoxite, a new metal vital to the space program. They're in the field (probably Peru), checking out a very pure specimen obtained from an Indian, when a canoe drifts by. Inside is the Indian! He tells how a giagantic turu -- a bird -- snatched his brother and flew off. Investigating the team learns the ""bird"" is actually a giant pteranodon -- a bird like dinosaur thought extinct! And it obeys a strange old man who lives on a plateau! The old man is forcing natives kidnapped by ""Turu"", to mine trinoxite, which he thinks is valuable silver. He commands Turu to kill Dr. Quest and Race, but Race wins that fight, thanks to a trusty bazooka (Where does he get all those wonderful toys?). Stunned, Turu falls from the sky into the tarpits. Desperate to save his only ""friend"", the old man follows him in. The Quest team visits Canadian logging country at the government's request. While camping, they're met by lumberjacks who warn them to leave, because ""the forest holds many dangers -- including loup garou"". The next day, Jonny and Hadji are walking with Bandit when they encounter a skunk. Bandit runs, the skunk and the boys follow -- and wind up lost. Then they meet White Feather, an Indian (voice of Mike Road). White Feather tells them how to find their camp. He also tells them a ""bad wolf"" and bad men are at the river, and to make sure they follow his directions. Instead, they investigate the bad men... The bad men are a crew of loggers who are using hollowed out logs to smuggle gold downriver. And they want to keep this a secret. Jonny and Hadji are captured, and White Feather helps them escape. Then White Feather, and a ... friend ... help them unmask the werewolf, and put a stop to the smugglers. Dr. Quest has constructed, and is testing, the ""Underwater Prober"", a cross between a submarine and a tank. The Navy is interested ... and so are some mercenaries. Dr. Quest and Hadji leave for the mainland, to meet a scientific delegation from Calcutta. While Race and Jonny work to fix part of the machine, they are overpowered and the machine is hijacked. They manage to escape, briefly. Then Hadji and Dr. Quest are captured when they come to the rescue. Hadji saves the day and a guard gets ""stoned"", but the team isn't out of danger. Fortunately, the Underwater Prober proves up to the challenge. The pirates try one last gambit, and Race turns the tables on them -- they meet a fitting end indeed. Confident the machine is ready, Dr. Quest turns it over to the Navy. Unexplained disappeared boats have made Dr. Quest interested in the mystery of these disappeared people. It turns out that a secret installation headed by a rogue general contains a huge missile in which he will use to knock down a launch. When Jonny and Hadji are captured, Race and Dr. Quest sneak in to rescue them and destroy the installation. The General kills himself when he shoots one of his soldiers that controlled the underwater mines and when shot the soldier landed on the switch that was near the general's boat. A doctor develops a formula that creates supersize monsters. With the help of the Quest team, the doctor and all his plans are destroyed. Bigfoot look-a-like monsters attack a village from a monastery connected only by a rope bridge in the mountains. People are scared of this monastery because they believe it to be haunted by monsters which later turn out to be humans dressed in costumes. As the Quest teams figures this out they engage in a clumsy battle with the fake monsters. A surprise happens in the end when a real Sasquatch monster kills all those who wore the costumes and heads back into his cave in the mountains. While returning from vacation Jonny and his father come across an abandoned seafaring ship. Unbeknownst to them an ancient sea dwelling evil lurks within the bowls of the ship. Unexpected treasures and horrors await the Quest Team. Jonny Quest Video Handbook - All About the Heroes, Villains, Locations and More.